UK, 2014, 1st UK edition. 144 pp, photos. 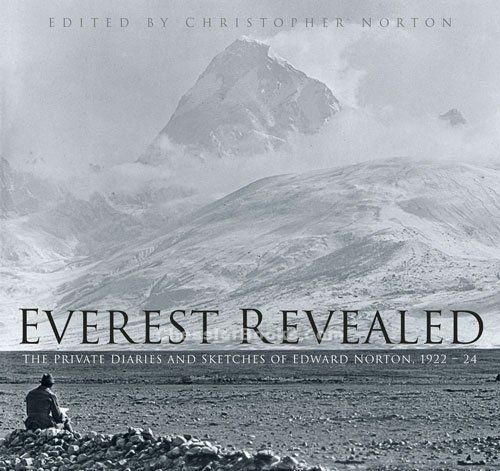 a new book about Edward Norton, based on the private diaries of the leader of the 1924 British Everest expedition. This is the expedition where Mallory and Irvine disappeared on their way to the summit. Larger hardcover with dust jacket, new. Edward Felix Norton DSO MC (21 February 1884 � 3 November 1954) was a British army officer and mountaineer. He was educated at Charterhouse School and the Royal Military Academy, Woolwich, and then joined artillery units in India and served in World War I. He had been introduced to mountain climbing at the home in the Alps of his grandfather, Alfred Wills. His experience led to joining the British Mount Everest expeditions in 1922 and 1924, and reached high elevations both years. His 8570m height (reached on the grand couloir route) was a world altitude record which stood for nearly 30 years, only being surpassed during the unsuccessful Swiss expedition of 1952. In 1924, he took over leadership of the expedition when General Charles Granville Bruce fell ill, and Norton was praised for handling affairs in the aftermath of the disappearance of George Mallory and Andrew Irvine . He served at Staff Colleges in India and England, and commanded the Royal Artillery and later the Madras District in the 1930s. During 1940-41, he was acting governor and commander-in-chief, Hong Kong. He retired in 1942.